Note: this is The Duluth Traverse Shuttle for riders looking to do a west-to-east ride. 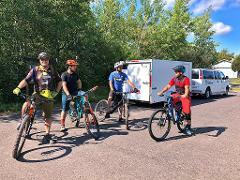 Load your bikes and gear into The Duluth Traverse shuttle trailer and hop in the van. We'll provide convenient transportation to multiple drop-off locations along The Duluth Traverse. Select a pickup location at Lester Park, Twin Ponds, or Grand Avenue Chalet. Hop off at any of these locations or take the shuttle all the way to Chamber's Grove and ride the entire west-to-east route. This is an unsupported ride so be prepared! Important: Pre-registration is required. When booking your shuttle, please note that the "from" and "to" listings in the drop-downs are shuttle pickup and drop-off locations, respectively. Also note that the shuttle will depart on time so plan to be ready to load your bikes and gear before the scheduled departure time. Riders need to be self sufficient in navigating the trails and carrying all necessary food, water, and supplies. We'll shuttle you from your vehicles to your drop-off location. From there, you're on your own - enjoy the adventure. Rock on! Note: this is The Duluth Traverse Shuttle for riders looking to do a east-to-west ride. Load your bikes and gear into The Duluth Traverse shuttle trailer and hop in the van. We'll provide convenient transportation to multiple drop-off locations along The Duluth Traverse. Select a pickup location at Chamber's Grove, Grand Avenue Chalet, or Twin Ponds. Hop off at any of these locations or take the shuttle all the way to Lester Park and ride the entire east-to-west route. This is an unsupported ride so be prepared!